Lion, ready to spring, in Samburu National Reserve, Kenya. The lion is an opportunistic predator, selecting prey individuals as chance presents them. 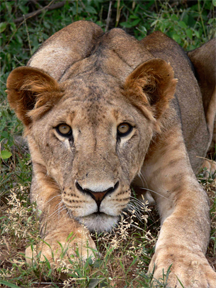 Their exact algorithm is unknown, but factors that enter her decision probably include the availability of cover, the vigilance of the prey, the disposition of other members of her pride, and the urgency of the need to feed. Your decision to pursue a particular political opportunity will also depend on an array of factors, including some of the items mentioned here. But certainly there are others: how close you are to retirement, how healthy the company is, and your ability to find jobs elsewhere, to name just three. What is your personal decision algorithm? Photo by Richard A. Muller. As you navigate the politics of your organization, opportunities occasionally come your way. Evaluating them can be challenging. What criteria do you apply when you decide whether or not or how to pursue an opportunity? Here's Part I — the basics — of a set of attributes that make some political opportunities more attractive than others. If pursuing the opportunity is consistent with your sense of ethics, you'll feel better about it however it turns out. If pursuing the opportunity violates your sense of ethics, your pursuit might extract an emotional price. Over time, as you accumulate a collection of transgressions of your own ethical code, the burden can become difficult to bear. Staying within your own ethical boundaries can be the most comfortable path. Every opportunity requires something from you. It will be work, after all. If you strongly dislike what you would have to do once you secure the opportunity, or if you're strongly averse to it for some reason, the chances that you'll be glad about getting the opportunity are slim. Performing well will be difficult unless you actually want the opportunity. Some efforts aren't truly central to the overall goal of the organization. They get funded anyway, for a variety of reasons. Perhaps someone with clout wanted it done. Or perhaps an external agent (a customer, a government or a partner organization) exerted undue influence to make it happen. Such opportunities aren't as helpful to you as opportunities that the organization really cares about. The truly valuable opportunities are aligned with organizational goals. Maybe nobody else has yet spotted this opportunity. Maybe you are the best positioned to pursue it. Maybe it requires a skill set that's uniquely yours. Or maybe the people who are aware of the opportunity lack the network connections that you have. Whatever your advantage is, it gives you a significant edge. If you require assistance from above, the opportunity is more valuable if the people who help you aren't at risk, even if an unfavorable outcome materializes. They usually have a lot to lose, and if an unfavorable and threatening outcome looks likely enough, these allies or mentors might have to abandon you. Devise a strategy that protects these assets. You'll be happy if you pursue the opportunity and you secure it. But what if you don't secure it? If the result is a political configuration that leaves you with more options and more desirable options than you had before, you've made progress. Would you like to see your comments posted here? rbrentPxuqsHtnqPFZHUbner@ChacgImWxoJOOapvtGdVoCanyon.comSend me your comments by email, or by Web form. I offer email and telephone coaching at both corporate and individual rates. Contact Rick for details at rbrenipjunYIYmIETYQhUner@ChacPStuBCxqrLviVYqgoCanyon.com or (650) 787-6475, or toll-free in the continental US at (866) 378-5470.